Freelancing has become very popular with a wide variety of people. From those working regular jobs looking to earn a little extra income or for those that want to pursue a career in a field that they excel in, freelancing is the way to go. Freelancing allows you to manage your own time doing what you love to do eliminating the stress of forcing yourself to do a job and giving you more time to enjoy with your family and friends. Choosing a freelancing website to use can be very beneficial to you as it will open many doors to job opportunities and ultimately more money. 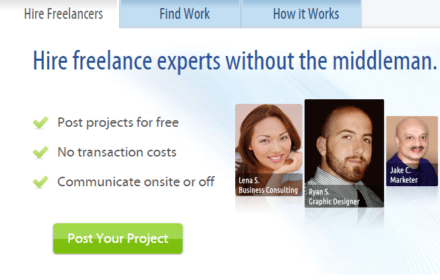 iFreelance is one of the top freelancer websites available and this review aims to help you decide if they are right for you by taking a peek under their hood. Unlimited Bids – As a freelancer it is important to have as many job opportunities as you can get and most sites limit the number of job you can bid for depending on the membership that you have. This means you have to pay more to be able to bid for more jobs. With iFreelance, you get UNLIMITED bids with whatever membership you subscribe for. This lets you get more opportunities to be hired at no extra price, unlike other freelancer websites. No Commission Fees – Most freelancer websites charge a commission fee, meaning they take a part of what you earn for themselves. While this is mostly minimal, ranging from 3-10% per transaction (though some can reach as high as 20%), it can add up to a large amount especially if you have multiple jobs. iFreelance does NOT charge a commission fee meaning whatever amount you get paid, you get 100% of it. They do charge a monthly membership fee since they also need to make money. As you can see it won’t cost you a lot to sign up for an iFreelance membership. You can also avail of lower membership rates for longer billing cycles (i.e. 6month, 12month, 18month billing). 1. No buyer/seller protection – One of the benefits that iFreelance boasts about is that you get to deal directly with your employer/freelancer without having to go through a middle man. While this sounds more appealing, you have to also take into consideration the risks this involves. No Escrow payment: since you are dealing directly, payment is also made directly depending on your agreement so a dishonest employer may not pay you for work you have done or a freelancer might scam you into paying ahead and not doing any work at all. You can use the in site messaging or communicate outside the site via email or texting depending on your agreement, but this means that iFreelance will have no official record of your conversations in case you want to dispute something with an employer or freelancer. iFrelance literally removes itself from your dealings with your employer or the freelancer you will hire as they want to be just a way for you to connect and the rest is up to you. They don’t have any liability with the exchanges and with minimal customer support, you might find youself in a pinch if you come across a dishonest person. 2. Minimal Customer Support Options – iFreelance only has email support where you leave your question and contact details on their site and wait for a reply. This can take very long depending on the nature of concern and volume of concerns their support team is handling. They don’t offer a hotline number, live chat, business address or even a forum unlike other freelancer websites. 3. Steep Competition – Having unlimited bids also has its downside, yes you can apply for all the jobs you want (even don’t want since you have an unlimited number) but so can every other iFreelance member. Though employers would most likely look at the qualifications of the freelancer to weed-out those who don’t qualify, you would still be in competition with practically every qualified (or better qualified) candidate for the job. As we have said, iFreelance does not charge any commission fees but only a monthly membership fee. If this gives you a negative vibe to iFreelance then take this into consideration, the average freelancer website will charge a 5-10% commission rate so for every $100 you make, they get $5-10. If you are making $500/month (which is low for a freelancer), then you would be paying $25-50 in commissions meaning you only take tome as much as $475. With iFreelance, earning $500/month less their membership fee of $12 (take not that this is the most expensive membership option)., you take home $488. That $13 difference every month goes a long way, in a year you save $156 earning $500 with iFreelance compared to other sites. What's the Verdict on iFreelance? Though iFreelance does not offer free membership, it is still a good step to take for freelancers. Their basic membership costs only $6.25/month (or less with a longer billing period) so it is very affordable. iFreelance gives you a chance to maximize your earning potential as even the basic membership gives you unlimited bids unlike other sites where you have to pay to get more bids. And if you are working on multiple jobs already, you would be earning more with iFreelance as they do not charge any commission fee, just the membership fee which again is very affordable. If you are a new freelancer or an experienced one, we recommend subscribing for an iFreelance membership. As a freelancer it is best to use multiple avenues to find jobs to do and iFreelance will get you those jobs.